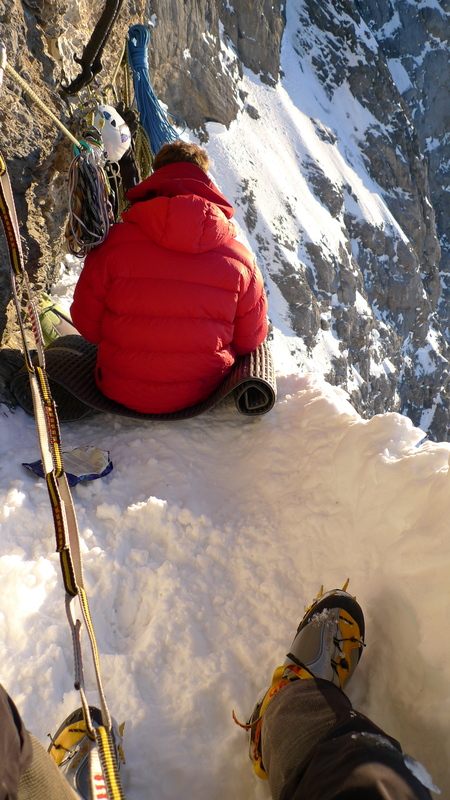 We recently reviewed the Jöttnar Bergelmir Shell Jacket and the conclusion was that it was pretty damn good. So how does the Jöttnar Vanir Salopette compare? Jöttnar are a relatively new company, with a small range of quality kit that aims to “offer modern day suits of mountain armour, designed to protect you against your most formidable opponents” that opponent being, the weather! 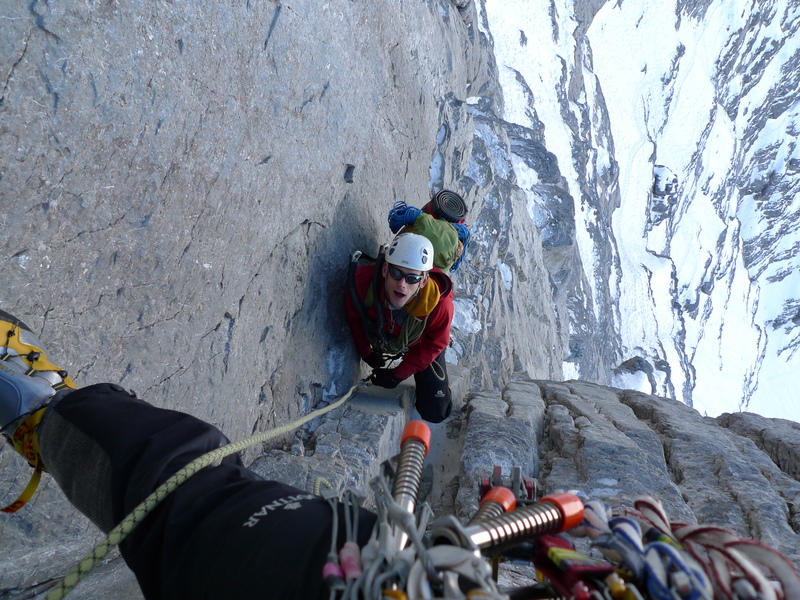 Jöttnar Vanir Salopette – great protection from the rain. Here seen used on some technical scrambles on the Idwal Slabs, North Wales. I have used the Vanir Salopette in a wide range of conditions over the course of what has been quite a long test, Scottish winter climbing (rain, wind, snow, hail and everything in between, plus a large dose of abrasive rock), Alpine climbing (extreme cold, altitude, warmth, north faces, ice, snow, rough granite and limestone) and also skiing. So they’ve had a pretty thorough test and battled quite a lot of formidable “Giants”. 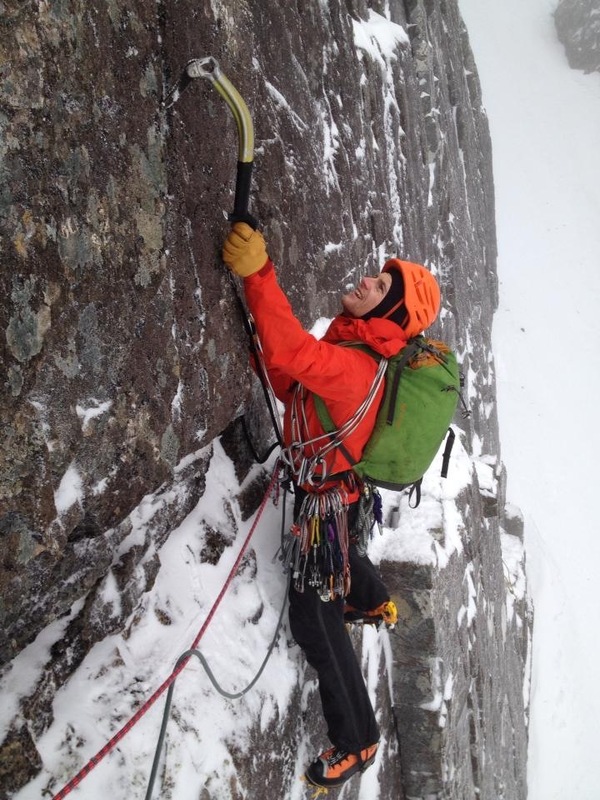 Jöttnar Vanir Salopette – driving wet snow, wind and fluctuating temperatures are typical of a Scottish winter day out and the Jöttnar Vanir Salopette coped brilliantly. I’d like to start by saying I’ve loved wearing the Vanir Salopettes. I usually hate wearing hard shell trousers, hating the rustling bulky fabrics and sweaty (breathable!) 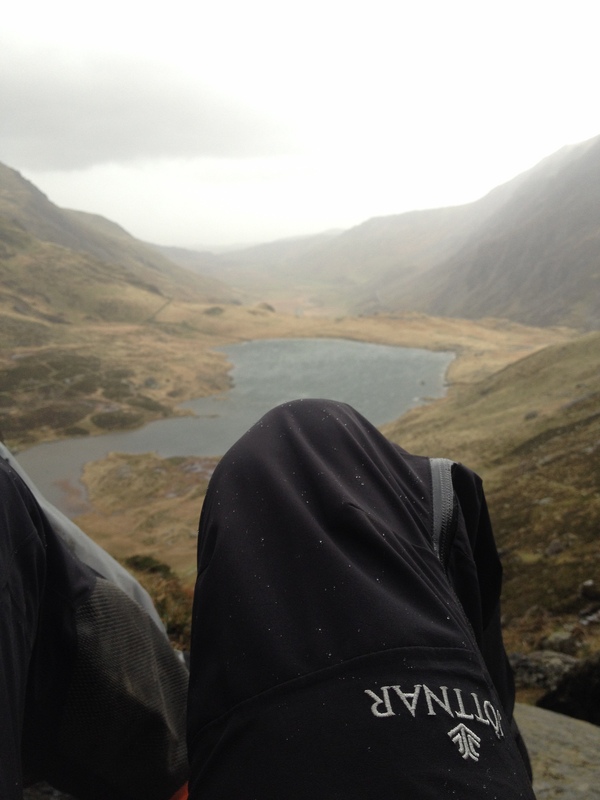 membranes, but this winter has been so wet when out in the UK hills, that I’ve really had no choice! Luckily the Vanir Salopettes arrived just in time and after their first outing there was never really any decision to be made. Usually if I thought I could get away with it I would definitely always wear softshell but after one day in the Vanir this winter, that was able to change! Jöttnar Vanir Salopette – the cold and dry conditions that can be found during an Alpine winter require clothing that is flexible and breathable but also ready to protect you if the weather changes suddenly. 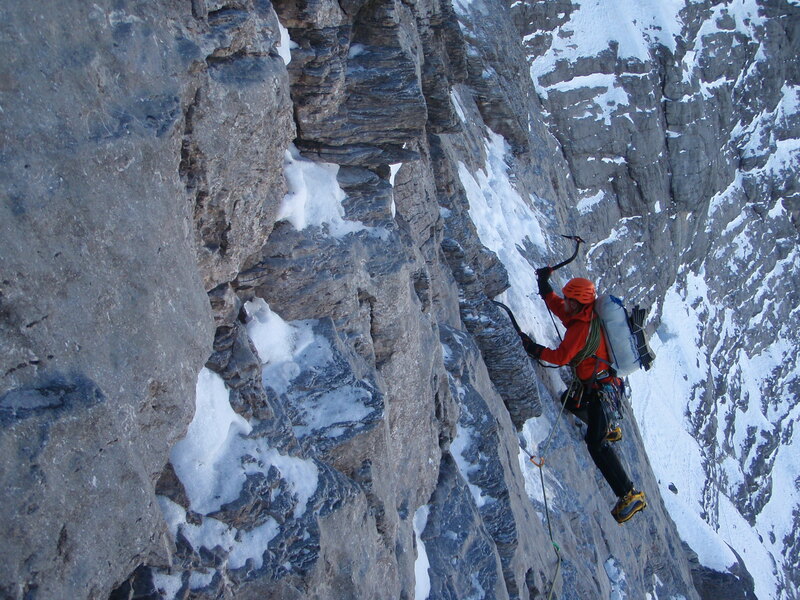 Here the Jöttnar Vanir Salopette gets an outing on the Eiger North Face. It wasn’t just the fabrics and sweaty membranes that had put me off hardshell trousers in the past, it was also the cut. I could never find a trouser that was cut perfectly for technical climbing. They were usually too baggy, more for general mountaineering and skiing. And that was the first big positive I noticed with the Vanir Salopette, the cut (which is described as athletic) actually seems to have been designed with climbing in mind! It’s perfect! And I can still wear them with ski boots if I need to, although it is a snug fit. In his review of the Bergelmir Shell Jacket, Dave described it as a “hardshell with a soft side” and I would say exactly the same for the Vanir Salopette. 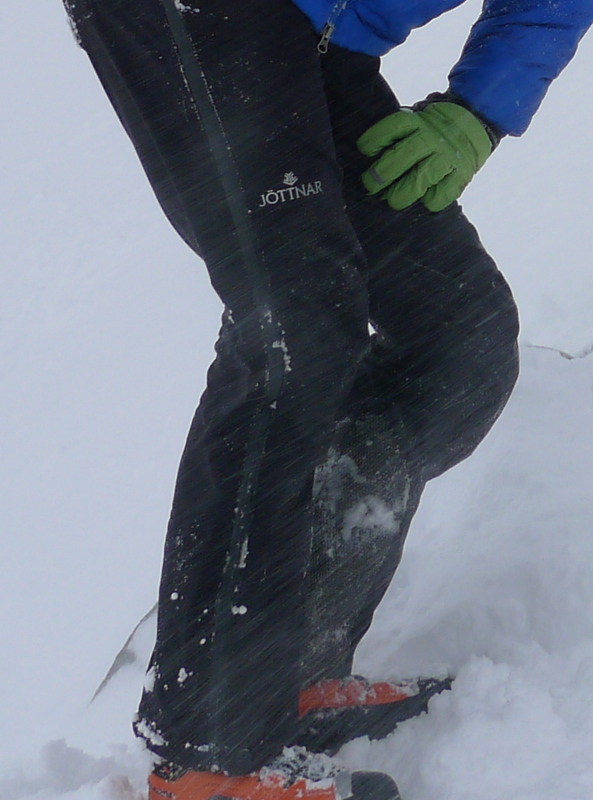 They are fully waterproof hardshell trousers but feel as comfortable to wear as softshell trousers. I love the stretchy face fabric, which when coupled with the excellent cut, was brilliant to climb in, being protective and unrestrictive, tailored with fabric just where it is needed and not where it’s not. The articulation seemed perfect for me! Clearly a lot of thought has been put into this and it’s paid off as these are the best fitting technical hardshell pant/salopette that I’ve used. The Vanir Salopettes have waterproof zips which open all the way up to your hips and this means that they are easy to get on and off whether you have trainers on or ski boots. Whilst the Vanir sports waterproof and breathable Polartec Neoshell fabric up to the waist on the back and the chest on the front, the rear bib part of the salopette is constructed from a stretch woven fabric, the idea being that this will be more comfortable and breathable against your back, particularly when wearing a pack. I don’t think the bib part of the salopettes needs to be constructed in a membrane fabric at all really as if it is raining or very windy then you would likely be wearing a shell jacket of some kind anyway. Jöttnar Vanir Salopette – won’t let you down in demanding mountain environments. The front of the bib has a zip which runs from chest height down to your crotch so ventilation is easy, as is taking a pee! However answering more serious calls of nature is not so easy, particularly when wearing a climbing harness and although you can release the elasticated (and easily adjustable) braces without fully taking off your outer jacket, you still need to drop your harness and it’s all pretty fiddly to get back on afterwards. There is definitely a challenge out there for a company to design a brilliant pair of salopettes like the Vanir but that are easy to use when answering calls of nature! I suppose it’s all a balance and ideally you won’t have to “go” more than once a day anyway! The fly zipper on the Vanir is easy to use when wearing gloves and the belt is comfortable and secure even with a harness on. Just for interest, the toilet-friendliness issue is something we were conscious of but was ultimately out-prioritised by other considerations. Our preference was with 3/4 length zips in order not to have a zip running over the hip bone which, when worn under a harness for multiple hours with a heavy rack, turns into an uncomfortable pressure point. The other drop-seat method, where the zip curls around the mid-point on the backside, was also discarded. In our own testing and experience, a zip orientated in such a way becomes a real point of weakness due to the forces exerted on it by the continual bending, twisting and stretching of the buttocks and hips. From an aesthetic perspective also, it’s not a particularly elegant look and it would have compromised the tailored fit that we wanted. In my own experience, drop seats really don’t add much at all in the way of convenience and the process is made no less uncomfortable or inconvenient with them. As long as you can easily remove the braces, which you can on Vanir, then the whole toilet episode is manageable. I fully appreciate that this is a personal preference thing, and it was a subject of much deliberation, but our priorities here were driven by fit, climbing performance, comfort and simplicity. 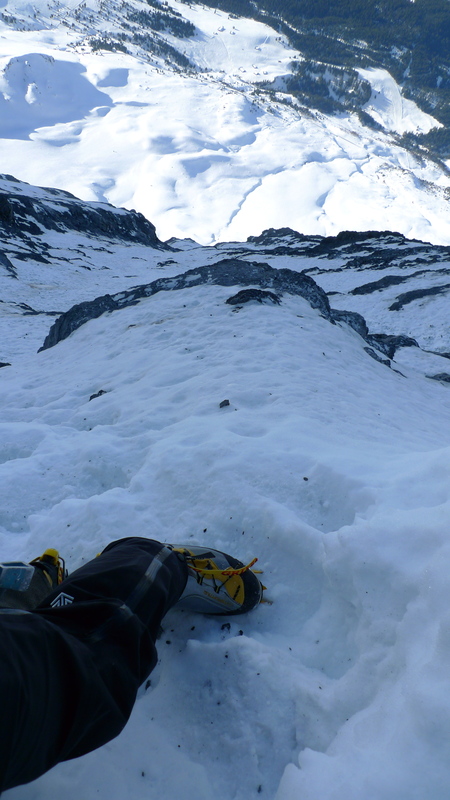 One of my favourite features on the Vanir Salopette are the huge Kevlar kick patches which protect the ankle and lower leg area from crampon spikes, ski edges and general abrasion. These patches probably reach twice the height of any other technical trouser/salopette I have used (hardshell or softshell). I have to say that on all these other trousers, I never once put a hole in them in the kick patch area (it was always too low) and it was always just in the area above. Needless to say, I have not put any holes in the Vanir, as the protection is actually where you need it! The “Waterproof, breathable, stretch, 3 layer Polartec® Neoshell® in legs, seat and front bib. 136 g/m2″ main fabric has proved to be very durable with no holes and only the odd loop pulling from the outer face fabric where they have been exposed to sharp points such as racked ice screws. The other main wear areas, the seat and knees, are actually both reinforced as well. Jöttnar Vanir Salopette – note the HUGE kick patches on the insteps! Other features I really like on the Vanir Salopette are the internal gaiters, which provide a snug fit over my mountaineering boots, sealing out any moisture. This works particularly well if you add bungy elastics to the tie down loops. I did find that with the gaiters fitted the whole system was a little tight to work comfortably with my ski boots but in these cases I just removed the gaiter and everything worked fine. The Vanir Salopettes have a few pockets to store valuables and keep them safe. There are 2 chest pockets and 1 trouser pocket. This is more than adequate and they all close using waterproof zippers with glove friendly tabs. Jöttnar Vanir Salopette – waterproof zippers and nice attention to detail. So to conclude, the Vanir Salopette is a brilliantly cut salopette for technical climbing (the best I have used) and also works for skiing. The stretch Neoshell fabric gives the protection of a hardshell with the comfort and freedom of movement of a softshell and protects from any wind rain and snow the worst Scottish winter can throw at it! The quality of these salopettes is awesome and attention to detail has been everything. They’re not the lightest piece of leg protection out there but they’re definitely bombproof. They’re also not as easy to use when answer calls of nature as I’d perhaps like. I’d love to see a standard trouser version of these with removable braces. All in all a great piece of kit and worth the hefty price tag in my humble opinion. It’s not often we give out 5 start ratings across the board! Find out more at the Jöttnar website.